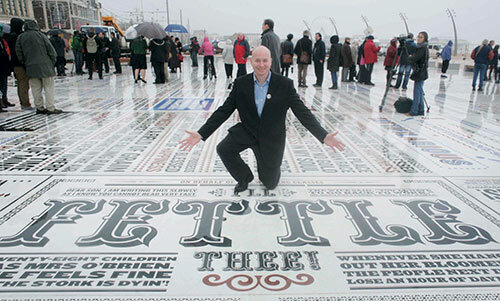 Graphic designer Andy Altmann of Why Not Associates, London, presents the Comedy Carpet he helped create. I would bet that when you think about concrete, humor is not the first word that comes to mind. Then again, you aren’t Gordon Young. Young, a visual artist who specializes in public art in the U.K., has created some amazing works of art with concrete. His most impressive to date is the Comedy Carpet at Blackpool. The Comedy Carpet is a 2,200-square-meter courtyard made up of 320 individual slabs of concrete made to look like show bills, variety posters and newsprint, all paying homage to British comedians as well as foreign comics who played Blackpool. The lettering and characters were created out of red and black granite and blue concrete, all cut out and embedded in a perfectly white concrete base. A seaside town on the Northwest coast of England, Blackpool has long been a popular destination for British and foreign vacationers. During its heyday in the early to mid-1900s, Blackpool teemed with workers when factories would shut down for maintenance and upgrades. It was during this time that comedy came to the fore, as stand-up was a popular form of entertainment for Blackpool vacationers. Once Young had an idea of what he wanted to do, he had to figure out how he was going to do it. He met with someone he calls “an old guy, a chemist in Bristol,” who is an expert in pigments. He had meetings with other chemists, too, to start figuring out how to create the concrete he wanted, and he talked to people familiar with different types of granite and sand. Young interviewed a few concrete contractors and soon realized that the scope of the job was simply too unusual, and therefore risky, for most conventional contractors. He decided to put his own team together. Having done projects with embedded figures in concrete in the past, Young had some contacts from which to build a team. He started with Why Not Associates, a graphic design company based in London. Then he added Andy Sawyer, an engineer with a reputation for taking on unusual projects, and Russ Coleman, a stonemason and sculptor. With his core team in place, he recruited experts in international stone and sand, chemists, and machinists. Young searched the globe for his materials. The red and black granite and the white sand came from India. One pesky detail — they needed to find a suitable setting in which to cut the granite and concrete letters and characters, then pour the concrete slabs. Young found a factory that fit the bill. However, it was hours away from Blackpool, creating yet another logistical factor. 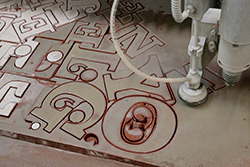 Sawyer became the factory manager, responsible for setting up the flow of work — cutting the letters and characters, gluing them in the forms, mixing and pouring the concrete, removing the slabs from the forms, polishing them, and ultimately preparing them for shipment. Coming up with a mix that would work for the surface of the Carpet proved to be a huge challenge. After the panels were delivered and placed, they had to be polished again. And once again, the Comedy Carpet presented unique challenges. Starting with 25-grit pads and graduating to 1,500 grit, the Comedy Carpet team was able to achieve a mirror-like finish. The end result is one of those prized decorative concrete installations that gets a response from passersby. Specifically, they stop to read it and they laugh. “I knew we hit the mark when I went out to watch people reading the carpet — they shuffle sideways as they read, laugh to themselves or share a laugh with a stranger,” says Andy Altmann, graphic designer and one of the founders of Why Not Associates. In case you’re wondering, the dry British humor had no discernable effect on the cure rate of the concrete. Client: City of Blackpool, U.K. 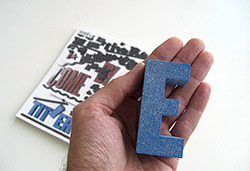 Scope of project: Create a 2,200-square-meter concrete courtyard that looks like a sea of show bills and newsprint. 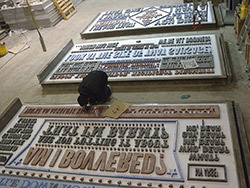 Most challenging aspect: Finding materials that would both work for creating the “newsprint” and stand the test of time, setting up a factory to create concrete panels, engineering mix ratios that would flow into the smallest areas of the lettering without vibration, transporting and setting panels.